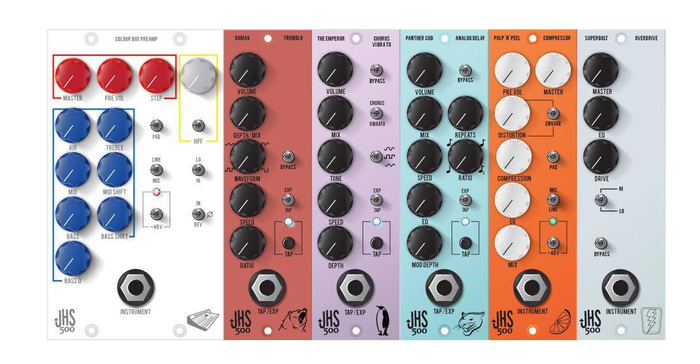 JHS Pedals converts its line of guitar effect pedals to the 500 format, with six models introduced at the NAMM and to be released later this year. The Colour Box 500 mic pre and EQ with tones ranging from clean and refined to thoroughly distorted, based on a 1073 gain stage. It is announced at $899. 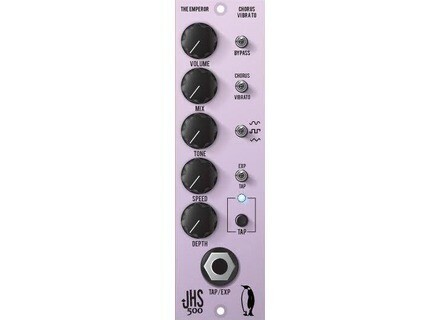 The Pulp N Peel 500 compression, distorsion and EQ module features a true internal mic pre utilizing the THAT 1512 and output section using the THAT 1646. It also allows parallel blend and is announced for $699. The Panther Cub 500, a true bucket brigade analog delay driven by the MN3005 chipset for smooth, dark, organic repeats with onboard modulation, EQ, tap tempo and expression pedal abilities. MSRP: $599. The Emperor 500, an all-analog signal path tap-tempo modulation effect unit delivering true bucket brigade analog chorus and pitch vibrato for $599. The Kodiak 500 all-analog signal path tap-tempo tremolo, priced $499. Finally, the SuperBolt 500 all-analog discreet overdrive - announced as a premiere on the 500 market. Price is $399. All will start shipping on April, 1st 2016 (no joke). More details at JHS Pedals's website. JHS Pedals present The Crayon JHS has introduces The Crayon, its new "Direct-In Distortion"-style fuzz pedal. JHS Pedals introduces the Twin Twelve JHS Pedals has worked on the stompbox version of the 1963 Silvertone 1484 “Twin Twelve” guitar amp, a pedal that will be available next week.